This year may be a good year to spot pine siskins in Westborough. Fall is a season of change, especially in Westborough’s bird life. Some birds stay year-round, and predictably, right on schedule, many birds leave, certain birds come for the winter, and others pass through. But a few arrive unpredictably, appearing in some years but not in most years. This year seems as if it will be a good one for at least one of those unpredictable visitors. Pine siskins have already been flocking to and through Westborough. What do these irregular visitors look like? Pine siskins (Carduelus pinus, Spinus pinus) are small birds, a little smaller than chickadees and about the same size as goldfinches. They’re abundantly streaked with brown. 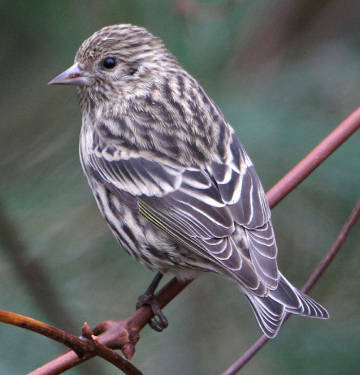 At first you might mistake a pine siskin for a female house finch because of the color and streaking, but pine siskins are smaller than house finches and also have thinner, finer bills. Pine siskins also sometimes have a yellow tinge on their wings and tail, but it can be hard to see. Males and females look quite similar. Where might you find pine siskins? Their name tells you to look for them in pines, such as the white pines that are so common in our woods. These little birds also like the Norway spruces and blue spruces that have often been planted near homes. If you see a bird hanging upside-down from the end of a pine branch in order to eat seeds out of a pine cone below, you might be looking at a pine siskin. Also keep an eye on your bird feeder, especially if you’ve put out thistle (nyjer) seed. You might find pine siskins joining – and competing with – goldfinches for it. They also like hulled sunflower seeds and millet. Pine siskins tend to travel in flocks, so if you spot one, you’re likely to find others nearby. A whole group might hang out at your thistle feeder. Listen for a lot of twittering among members of the flock as they keep in contact. Where do they come from? Pine siskins typically live year-round in northern forests of cone-bearing trees, in northern New England and Canada. There they eat the seeds out of cones of pines, spruces, and firs. What brings them to Westborough and other places south of their usual range? No one knows for sure, but the usual explanation is that they move in large numbers, or “irrupt,” to the south in years when the cone-bearing trees of their northern forests produce scant numbers of seeds. Basically, they come for better winter food supplies. Are they also coming south to escape the cold? Probably not. Pine siskins are quite resistant to cold. They’re well prepared for the very low winter temperatures of their northern homeland. They actually fatten up for the winter, putting on 50 percent more fat than goldfinches. On frigid winter nights that are colder than any we ever get, they can boost their metabolism up to five times the normal rate to pump out extra body heat. And finally, they can store seeds in a pouch-like part of their throat called the crop, giving themselves extra fuel to burn for body heat during those long cold nights. Usually pine siskins are not alone in their flight to the south in years of poor northern seed production. Certain other northern birds also move southward into Massachusetts and elsewhere. For example, you’re more likely to see red-breasted nuthatches in Westborough this year. In some parts of Massachusetts, people have already reported seeing red crossbills and white-winged crossbills. Other northern birds that are likely to appear in parts of Massachusetts include bohemian waxwings, evening grosbeaks, pine grosbeaks, and common redpolls. They’re all looking for better food supplies. Fortunately, these birds all don’t eat exactly the same thing. They’re specialized in various ways to eat certain foods. Their type of bill makes a difference in their menu selections. Pine siskins, for example, are finches (like goldfinches, house finches, and cardinals), but they have thin bills so they go for small seeds. You can see this food choice at your feeders, where pine siskins go for the thistle seed, rather than the big sunflower seeds that house finches, chickadees, and cardinals can handle. The sunflower seeds contain more food, but they’re so hard for thin-billed birds like pine siskins to crack that they’re not worth the effort. But if other birds have made a mess and dropped pieces of sunflower seeds on the ground, pine siskins sometimes flutter to the ground to pick among the leavings. Enjoy any pine siskins you happen to spot in this irruption year. You may not see them again next year – or who knows, maybe you will!